Minutes of Steering Committee meetings will be available in summary format to all members via the FOSS blog. Summary minutes and event-related information will be sent to all members on the FOSS mailing list. 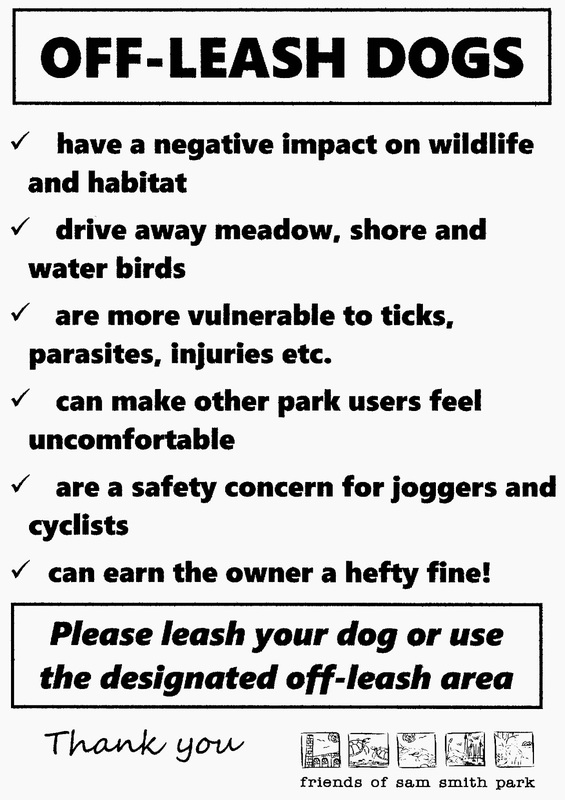 Signage wording to discourage off-leash dog walking approved by the Steering Committee is being considered for use in other city parks as well as our own. FOSS has made suggestions for improvements to the off-leash dog park to encourage usage and will informally poll dog owners for their ideas. A new bank account for FOSS will be arranged at the Bloor and Royal York branch of the Bank of Montreal. Future project possibilities discussed include: improvements to off-leash dog park, erection of bird feeders near skating loop, “crowd sourcing” via the web for fund raising, seeking sources for grant funding, spring clean up in late April, and the Bird Festival at the end of May. The location of the site is challenging in winter. Planting a wind break on the north side of the park would provide welcome relief from winter winds. The only trees that were around - on the west side - have been killed in support of the latest filtration plant renovation. Another big challenge is muck. Once the spring melt starts, it gets very muddy in there. Woodchips might help some with that. For summer, I bet a water spigot would attract dog owners. We live close by but in summer we often drive our dogs to other parks that offer fresh water and more land. Right now, I would say that Jack Darling, down the road in Mississauga is THE model of what can be done to make a fabulous dog park at a water filtration plant. Jack Darling offers a great variety of terrain, a forested bit, a sandy area, a lot of land, and fresh water.